I went out to a local wetland pond area with friends on Sunday - ( I am still trying to catch up with some posts!). 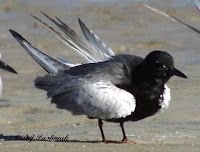 Its a very interesting area as we see different waders here from the ones we commonly see out around the bay. 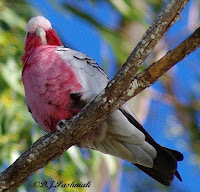 Neil over at Out and About in Cooloola has already posted about some of the birds we saw. We also often see raptors here - it must be an easy place for them to pick up a meal - but what usually happens is that everything gets frightened and then there are birds swirling everywhere in the air around us. This is what happened this time. 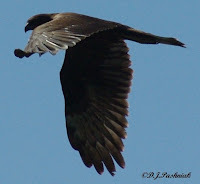 I am still not really comfortable with photos of birds in flight. It is OK if I have time to think about camera settings and get them ready - but not so good if I have to just try to point and shoot! So the photos I took are not great but certainly good enough for ID. btw - I have the camera but my friends have the expertise to ID the birds! (Thanks Kel and Neil!) 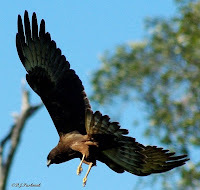 So this is a Swamp Harrier - a juvenile we think. This was definitely the first time I have ever seen this bird. 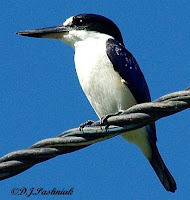 I also got my first ever photos of a Forest Kingfisher but although the photo is clear it does not show the beautiful blue color of the back feathers. The other frustrating thing about this site is that even though it is easy to see small birds out on the sides of the ponds with a scope it is impossible to get very close and so any photos are for ID only. This bird is one of a small group of Black-fronted Dotterel. 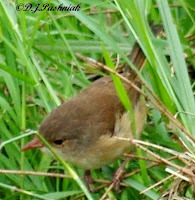 Its a very distinctive little bird and oh how I would like nice clear and close photos! 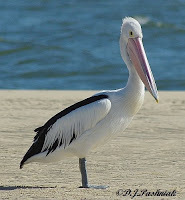 I enjoy watching and photographing pelicans - as I am sure I have said before! They are so big and ponderous and ungainly and dignified - all at once. Whenever I watch them I end up laughing at some of them. When I look into their big eyes I wonder what they are thinking of me - possibly what a nuisance I am for coming so close! 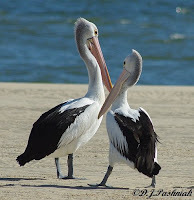 These are Australian Pelicans (Pelicanus conspicillatus). Yesterday was a very low tide and I was able to walk a long way out on the sand banks to where a flock of terns was roosting. I scanned quickly through the flock to see what was there before I started taking photos. There were mainly Crested and Common Terns - and the Crested Terns were most obvious because of the constant noise the juveniles were making. 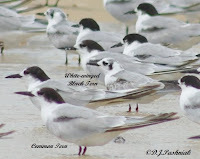 It was only after I started taking photos that I realized that there was one White-winged Black Tern in almost full breeding plumage. 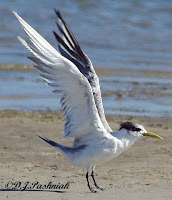 These terns are never easy to get close to and its been a couple of seasons since I have seen any in breeding plumage. I didn't get close enough for really detailed photos but sufficient to show the spectacular plumage that these birds get when breeding. 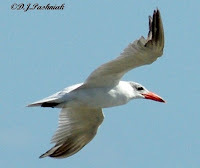 First a photo which I have posted before to show non-breeding plumage. 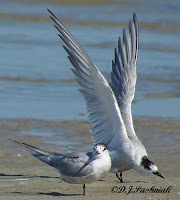 The White-winged Black Tern is on the right and a Common Tern on the left. 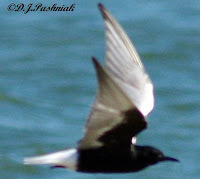 A blurry flight shot which nevertheless shows the wing colors. As I walked back I was just in time to see this parachute coming in with tandem jumpers. I don't know where they had come from as I only saw them just before they landed. I am usually so intent on photographing birds that I ignore the scenery around me - but not yesterday. It was a beautiful day and these are a few shots of the bay and foreshore at Tin Can Bay. 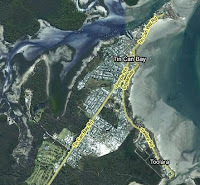 Google maps show how the bay surrounds the town. As well as the roads that go beside the bay there are also walking tracks - miles of them! - that are only a few meters from the water. This area has a large population of retirees and there are many who walk the tracks early in the morning. If you can no longer walk in the morning then its always possible to use a motorized scooter - and many do! Much of the land is very low lying and covered with paperbark trees. 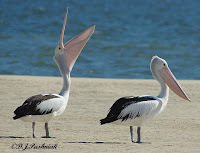 Even on the well-groomed areas of the foreshore there are plenty of areas left where the native grasses, shrubs and trees provide excellent habitat for birds. 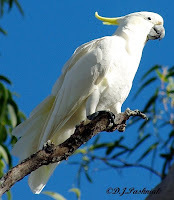 Most birds were out of sight in the tree-tops but its always possible to see Sulphur-crested Cockatoos and Galahs. 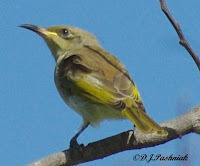 Of all the birds that pass through my garden the Brown Honeyeater is the hardest to ignore. Its song is certainly the loudest per body weight of any other bird. However, it is so small that I usually find it is hard to see among the tree leaves unless it obligingly breaks into song right in front of me. Yesterday I had been listening to and intermittently trying to photograph a couple of these birds. Then I heard such a noise! It was the harsh sound that the bird makes for alarm or distress and there was such a fuss going on that it had to be more than one bird. I hurried out and tracked the birds from one bush and tree to another. There were three of them and making such a noise! They were so intent on each other that I got quite close to them before they even saw me and then one flew away. The other two immediately started to settle down. 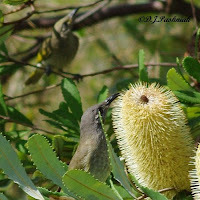 There were still a few bursts of harsh noise but when these were not answered they settled down and started on the important job of finding honey in the flowers of a banksia plant. So what was I seeing and hearing? Was this a matter of three being a crowd - prior to mating and breeding? I don't even know when the nesting season happens in my area. I still find the seasons in this tropical area where I now live so very different! I am hoping that some of the Aussie nature bloggers will be able to give me some answers. 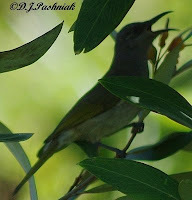 A Brown Honeyeater hidden among the leaves and singing loudly. Hanging upside down on a banksia flower. Please let me see a front view! Poor DOF but a record shot to show the two birds. The Red-backed Wren is the smallest of the Fairy Wrens. These ones were busily feeding in the grass when I saw them the other day. They are so tiny that the long grass easily hid them. 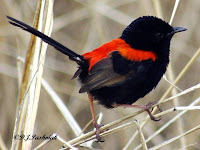 Only the males have the bright scarlet color - females and eclipse males are the plainest colored of all the Fairy Wrens. Part of the fun of birding is that one never knows exactly what to expect. This morning I went for a walk at low tide expecting to see shorebirds out feeding on the exposed sand banks - and there were none! 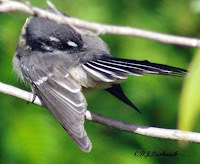 Instead I saw and photographed a bird that has been impossible to photograph until now - a Grey Fantail. These birds are quite common - so what have I done wrong? This morning one came and sat and looked at me - and even spent a while preening - so I guess finally it was just the right time and the right place. Of course next time it would be nice to get photos without dappled shade on the bird! Just to make the morning even better a Brown Honeyeater sat on a top branch in clear view long enough for me to get photos. Another 'unexpected' morning - soon - would be great! 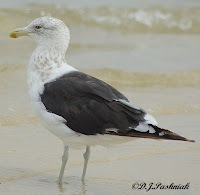 I went for a walk out at Inskip Point yesterday and saw another Kelp Gull out there. The previous one was there in February and I posted about it here. The plumage on this one is so different I think it must be a sub-adult but would be happy to have this checked by a birder with more knowledge than I have of these birds which are usually seen much further south than here. It's just two weeks since I was out there before and I was interested to see the darker breeding plumage on the Red-necked Stint. 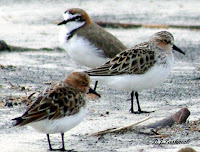 There was a small flock of Red-capped Plovers roosting with some Red-necked Stints right at the point. However, there were so many people and cars coming and going that they soon flew off to the sand island - at this tide height there was quite a lot of sand exposed out there. Silver Gull and Red-capped Plover - just to compare the sizes. There were quite a number of campers in the camping ground back from the point and they all looked as if they were happy to have some drier weather. The previous afternoon and evening my rain gauge overflowed - that is more than 170mm of rain in about 18 hours. The road in to Gympie was under water in three places and traffic was stopped. News reports also said that one car was washed away when it tried to cross a flooded creek but the people in it managed to get out and spent several hours clinging to a bank in the rain. I am not a great gardener! It's not that I couldn't develop the knowledge and skill but rather that I can always find an excuse to get out in my kayak on the bay. I came here nearly 6 years ago to a new subdivision with nothing except weeds and too tall pasture grasses. Since then I have planted things that look after themselves with minimal help from me. I have planted walls of green all around my half acre block and added color at intervals around. We are well into autumn now and here is some of the color that I have had around me over the last couple of weeks. I had Tibouchina trees growing where I lived before coming here and decided to plant them again. Heliconias definitely look after themselves. In fact the only thing I have to do is stop them from spreading too far. Bird of Paradise is always colorful. 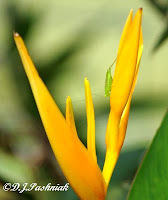 Cannas are another easy-care plant and the leaves provide nice color too. Some things don't show much flower but have been planted for the leaf color. Fennel flowering in the herb garden.